An under-the-radar phone call from the U.S. State Department puts Marc Royce once again on assignment—ferreting out rumors of a clandestine operation stretching from Asia to the Mideast. At stake is Iran’s threat to blockade the narrow Strait of Hormuz, cutting off vital shipping routes and escalating global tensions beyond the breaking point. Q: The first two books in the Marc Royce series have been bestsellers and also won praise from the critics. Lion of Babylon won the Library Journal’s Best Book of 2011 award, and Rare Earth won the 2013 Christy Award for Suspense Fiction. What do you see is behind this success? Davis Bunn: The stories have certainly resonated with readers. I have tried to develop a strong sense of unfolding drama, combined with a unique spiritual theme. This moral structure plays out both in the story and the characters. My aim is to create an inspirational challenge that remains with the reader long after the book has been set down. Q: This story includes two special components from your early life. Tell us about them. DB: My mother worked as an antiques dealer. In truth, ‘work’ was not really the correct term, because this was a passion she inherited from her mother. They bonded while my mom was still a child, going to small eastern Carolina towns and hunting around junk stores for the sort of bargains that don’t exist anymore. Their first love was early Americana, a type of colonial furniture known as Jacobean that predated America’s nationhood. I never really shared this passion, but in two previous books I came to respect and admire those who do. The second special component was the location. I lived in Switzerland for almost five years, and many of the venues were places where I worked, and walked, and came to discover myself as an author. Q: In what way is the setting important to this book? 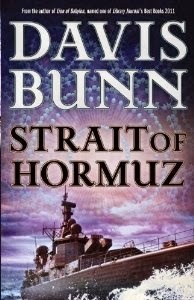 DB: The Strait of Hormuz is one of the world’s most critical waterways. Stretching between Iran and the Gulf States, the strait is home to two US fleets. More than a third of all the oil consumed worldwide pass through these waters. But the story actually begins in Switzerland, before traveling to the Sinai and then into the hotly-contested Strait of Hormuz. Q: What spiritual theme is the focus of this story? DB: One growing area of the missionary church movement is with displaced persons. More than five million Iranians have been expelled from their homeland, or been forced to flee the current regime. This includes virtually the entire Christian population. The missionary church movement has made enormous strides in bringing peace to these families and introducing Christ into the world of Muslims fleeing a Muslim government. Q: What drew you to the missionary church movement as a theme? DB: I came to faith in a missionary church. I was working as a consultant based in Germany. The year I accepted Christ, the Southern Baptist Mission Board founded a missionary church in Dusseldorf. I attended the church, I grew in the church, I studied under two amazing pastors, and one of them returned to Europe to marry us. It was also where I learned to write. Two weeks after coming to faith, I felt called to writing. I wrote for nine years and completed seven books before my first was accepted for publication. The church, its members, and the elders all played a critical role in bringing me to where I am now. I am living testimony to the vital role played by the missionary church. Q: All three of the books in this series have given significant insight into the Muslim world, something critics have picked up on. What experience do you have with this region? DB: For the four years prior to moving to Germany, I lived and worked in the Middle East. I was the only non-Muslim in the management structure of a family-owned company. They had three major arms: construction equipment, shipping, and pharmaceuticals. I rose to become Marketing Manager of the pharmaceutical division. One of the requirements of this job was to take instruction in the Koran and Islamic history from an imam who taught at the local university. I think this experience played a major role in my coming to Christ. 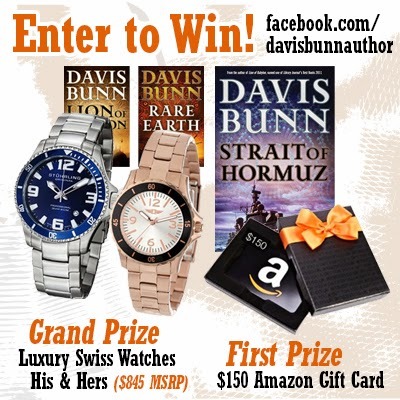 Help Davis Bunn celebrate the publication of “Strait of Hormuz.” Enter to win His & Hers Luxury Swiss Watches or a $150 Amazon Gift Card! http://woobox.com/ipi8wk. You can enter once per email address per day. Rack up bonus entries by sharing the contest with your Facebook and Twitter friends!